Mind Control Tech is a rare neutral minion card, from the Classic set. 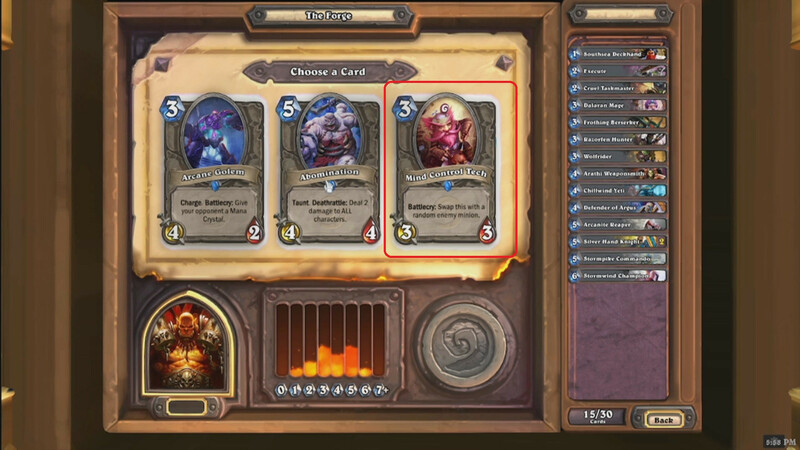 If the player's opponent has 4 or more minions when the card is played, its Battlecry will allow them to take control of one at random. Mind Control Tech can be obtained through Classic card packs, through crafting, or as an Arena reward. Golden Mind Control Tech can also be obtained through the Highest Rank Bonus chest at the end of each Ranked season. Because Mind Control Tech's Battlecry is untargeted (unlike Cabal Shadow Priest), you are not required to have a free space on the board for the minion it would steal when you play Mind Control Tech. Because of this, if the summoning of Mind Control Tech itself makes your board full, leaving no room for the stolen minion, the minion it attempts to steal will instead die, and any Deathrattle will be triggered for your opponent. Because of this, playing Mind Control Tech with a Brann Bronzebeard on the board will result in two separate minions potentially being taken control of (assuming the opponent has at least 5). This again assumes you have two space on your side of the board; if you have no spaces both minions will be destroyed, and if you have 1 space then 1 minion will be captured and the other destroyed. Mind Control Tech is good against decks whose objective is to fill the board with minions, such as Zoo, Murloc, or Hobgoblin decks. You may be able to steal a strong early-game or buffed minion, strengthening your board and disrupting the tempo of your opponent. Mind Control Tech is clearly inspired by the Gnomish Mind Control Cap from World of Warcraft. Using the cap allows its wearer to "engage in mental combat with a humanoid target to try and control their mind." Gnomes are known for their inventiveness, as well as for the unpredictability of their inventions, as reflected in this card. The artwork for this card comes from the World of Warcraft Trading Card Game "Wrathgate" series, for the card Crusade Engineer Spitzpatrick. The card art depicts Crusade Engineer Spitzpatrick, a gnome quest giver that appears in the Valley of Echoes in Icecrown. The attack quote of Mind Control Tech is a leftover from when he swapped places with an enemy minion. Patch 1.0.0.3388 (2013-06-22): Changed from "Battlecry: Swap this with a random enemy minion." to "Battlecry: If your opponent has 4 or more minions, take control of one at random." Alpha patch (unknown date, pre-May 2013): Text changed from "Battlecry: Swap this with a random enemy minion. That minion can't attack this turn." to "Battlecry: Swap this with a random enemy minion." This page was last edited on 17 June 2018, at 02:58.